ANY rider (not necessarily a Ducatista) who can summon from his or her memory bank a grainy image of the Vilar Cucciolo knows Ducati’s Borgo Panigale digs had in the past dabbled in building engine-kitted bicycles. The Cucciolo (”puppy” in Italian) may not have been Ducati’s own for instance — it initially referred to an engine that can be mounted to a bicycle — until 1950 when Ducati produced a “motorcycle” fitted with a single-cylinder engine, which can be pedaled as well. At this year’s EICMA, Milan’s annual motorcycle spectacle, Ducati relives its early days of bike-making as it brings out the MIG-RR. 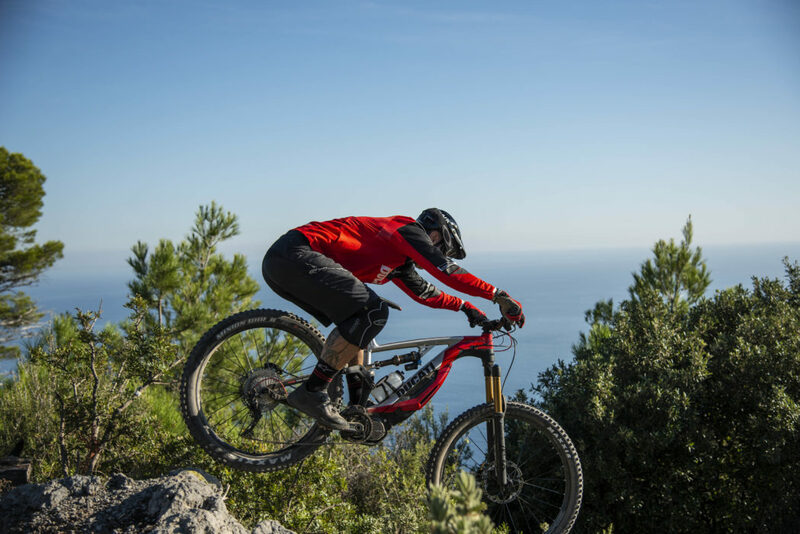 Built together with compatriot Thok E-Bikes, the MIG-RR is an electric-powered mountain bike — or e-mtb — whose 11-speed Shimano XT gear set is supplemented by a 250-watt Shimano Steps E8000 motor. The motor is juiced by a high-power 504 Wh lithium ion battery mounted underneath the bike’s downtube. 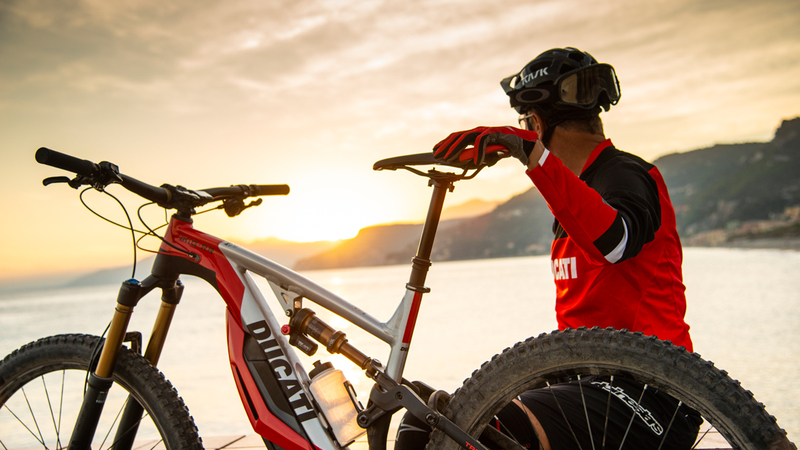 Electric motor-supplemented mountain bikes, of course, allow their riders to tackle steeper inclines and for longer distances, too. 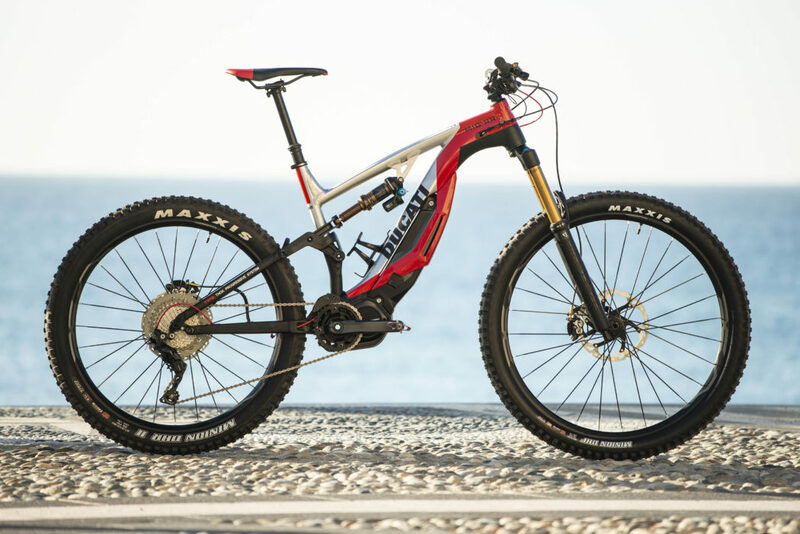 While this Ducati e-mtb belongs to Thok’s popular (and high-end) MIG series, it gets special items not found on its siblings. The MIG-RR has staggered-size Mavic wheels (29 inches in front, 27.5 inches in back) corresponding to different suspension set-ups. Wheel travel is 170 millimeters in front, 160 millimeters at the rear. Such an arrangement makes the bike suited to advanced enduro riders. Its other features aren’t any less capable for off-road use. Think Fox Factory Kashima suspension, carbon fiber Renthal handlebar and four-caliper Shimano Saint brakes. Plus, its graphics were rendered by Italian designer Aldo Drudi of D-Perf, who has not only worked on Valentino Rossi’s helmets for years, but has also built a motorcycle of his own — the Honda VFR1200F-based Burasca 1200. Not surprisingly, the Ducati Design Center had a hand in the MIG-RR’s looks, too. Set to be initially sold in Europe in the second quarter of 2019 (and on Ducati’s online store in January), the MIG-RR is no mere EICMA show piece — it will actually be a part of the Ducati lineup for next year. This means it will sit beside the Diavel, XDiavel, Hypermotard, Monster, Multistrada, Panigale, SuperSport and Scrambler models in select showrooms. And that should look electric.